The Tennessee Titans lost 20-19 to the Melvin Gordon-less Chargers in London because they couldn’t pull off the two-point conversion they elected to go for instead of the game-tying extra point. Head coach Mike Vrabel’s final play call was a little too ballsy. Tennessee was on the one-yard line after officials reversed a three-yard Marcus Mariota touchdown run to a two-yard gain. Despite having running back Derrick Henry on the roster, Vrabel chose to follow the Pete Carroll school of thinking and get the touchdown through the air. Unlike the Seahawks, the Titans made good on their call with a touchdown throw to tight end Luke Stocker. Vrabel emphatically lifted two fingers to signal the team’s intentions to go for the win instead of the tie. The team would end up with another chance at the one-yard line after a defensive holding penalty negated the incomplete pass on the first attempt. Feeling confident that his last gamble paid off, Vrabel leaned into his aggressive play-calling, the offense lined up in a no-back set. The Titans were not as fortunate the second time around. 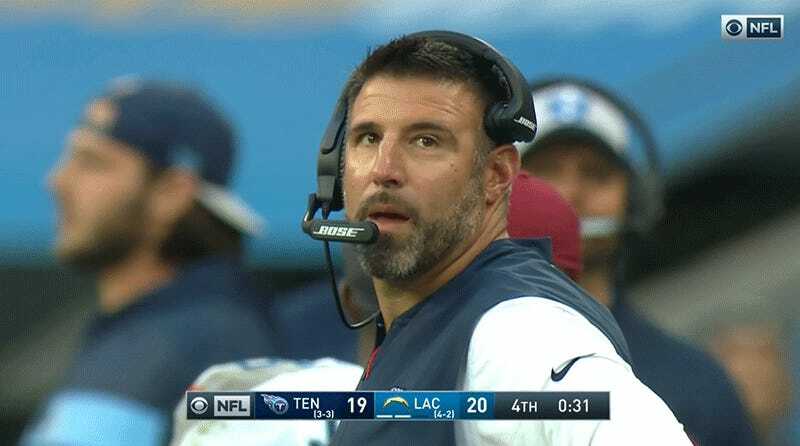 Chargers QB Philip Rivers gloated and Vrabel was left to sadly chew his gum. Vrabel defended his choice to go for two instead of the extra point in his post-game presser. But that wasn’t the concern. Bold decisions are one thing, but the play-calling has to allow those bold decisions a chance to succeed. The closest thing Vrabel gave to an explanation was that injuries were a factor. Really, Vrabel should’ve said he just wanted to get out of London as fast as possible. That would make the most sense.